50 A.E. 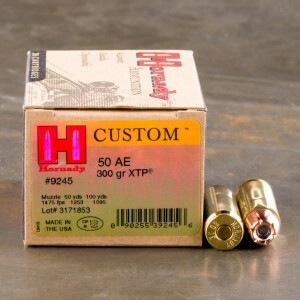 ammo is a powerful, large caliber pistol round designed for the Desert Eagle. The 50 A.E. 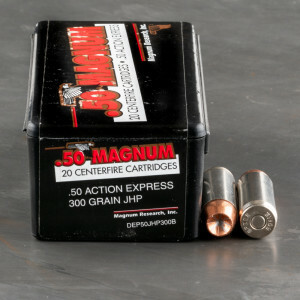 (Action Express) round has the dimension of 12.7 x 33mm, making the cartridge one of the largest automatic pistol cartridges The round is capable of producing an extremely heavy, but fast bullet. 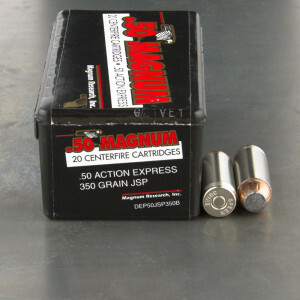 From a standard 6 inch barrel the round can reach up to 1,500 FPS with a 300 grain round.